During the first week of March 2016 an unusually prolific weather event pummeled the area near the Texas-Louisiana border, smashing rainfall records as well as homes, bridges, and other infrastructure. In some areas, over two feet of rain was recorded from this single event- an incredible amount that wreaked destruction and put many lives at risk. The massive amounts of rain put tremendous pressure on local reservoirs, and engineers were forced to open the gates, sending huge plumes of water downstream. For example, at the height of the water release operation at the Toledo Bend Dam, water was released at the astonishing rate of 1.5 million gallons per second! Precipitation levels recorded on March 11th, 2016. The amount of water released at the Toledo Bend Dam was record-breaking- never before in the 50-year service life of this dam had that much water been released. As might be expected, all that liberated water rushed downstream at perilous speeds, and resulted in river flooding throughout the area. Homes, businesses, farmlands, bridges, and roads were washed away. Some people, who may have little understanding of dams and reservoirs, questioned why the water was released, when so many people living downstream were grievously affected. The simple truth is that had engineers not released the pressure on the dam, the entire dam might have collapsed, causing a disaster that could have dwarfed the infamous Johnstown Flood in terms of destruction and loss of life. As it was, the water that was released from the dam caused widespread flooding and destruction, and this was in addition to the flooding that was already happening before the sluice gates were opened at the dam. All the rivers in the region were already nearing record crest levels, and after the dam water arrived, many rivers not only broke crest records, but smashed them. The Sabine River, which flows along the border of Texas and Louisiana, achieved a crest level a full five feet above the previous records, which went back to the year 1884. This particular storm only added to what has been a miserable year for the region, which suffered over a dozen major flash flooding events. Almost half a dozen reporting sites have recorded precipitation levels of 2 feet or more above normal levels for the year. This is an incredible amount of extra rain, and the region has suffered greatly in terms of loss: homes, roads, bridges, businesses, and agricultural ruin will require much effort and funding in order to return to normal. The cause of the rainfall during the first week of March was identified as a massive storm system that moved slowly across Mexico, then skirted around the coast of the Gulf of Mexico, all the while picking up moisture- which it dumped on the Mississippi Valley region. This region is well accustomed to enduring massive storms, but the rainfall amounts recorded this month crushed records in many spots. 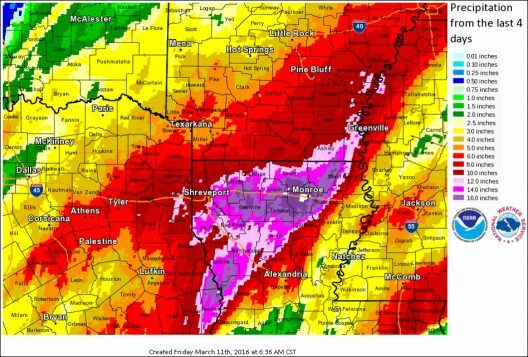 The weather station near Monroe, Louisiana recorded the highest amount of precipitation, at just under 27″ for the duration of the multi-day storm. Overall, the storm brought more precipitation that has ever been experienced in living memory, and perhaps will become known as the infamous Storm of March 2016; a storm by which future tempests will be measured. This entry was posted	on Monday, August 8th, 2016 at 6:00 am and is filed under Flood Protection. You can follow any responses to this entry through the RSS 2.0 feed. You can leave a response, or trackback from your own site.